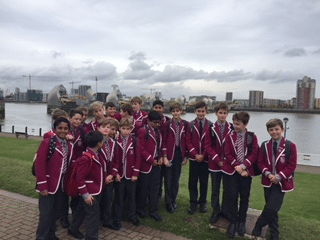 Last Friday Upper and Middle Sixth boys enjoyed an informative trip to the Thames Barrier at Greenwich. We were lucky to have the run of the visitor centre to ourselves in the morning and were greeted by our guide, Neil who gave us some of the history and future plans for the barrier. The Thames Barrier itself was completed in 1984 and prevents the floodplain of all but the easternmost boroughs of Greater London from being flooded by exceptionally high tides and storm surges moving up from the North Sea. The site at New Charlton was chosen because of the relative straightness of the banks, and because the underlying river chalk was strong enough to support the barrier. Work began at the barrier site in 1974 and construction, which had been undertaken by a building consortium was largely completed by 1982. The concept of the rotating gates was devised by Charles Draper and the novel rotating cylinders were based on the design of the taps on his gas cooker. Incidentally each revolving gate weighs the same as half the Eiffel Tower! Unfortunately, visitors no longer have access to the barrier and its two access tunnels but the visitor centre has a working model of how the barrier actually functions. This was supported by videos and displays which informed us how the barrier was constructed and why. It also introduced us to some of its local residents including a grey seal which decided to make a guest appearance before we departed for Milbourne.